DeZURIK V-Port Ball valves deliver superior performance and reliability required to optimize process performance. This versatile valve is designed for control of fibrous suspension applications, plus clean, dirty, viscous and corrosive liquids and gases. 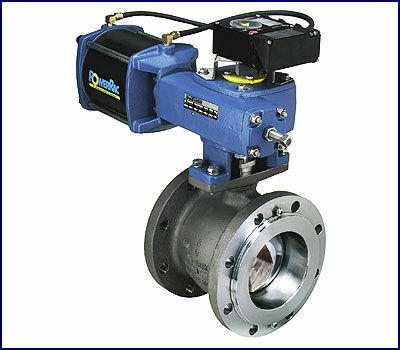 DeZURIK V-Port Ball valves feature one-piece construction and are available in flanged or flangeless end connections. They conform to or exceed North American and International Standards for control valves. Superior control performance is designed into the geometry of the ball for critical management of flow. A locked ball-to-shaft connection ensures no lost motion for critical control. Bearings, covers and fasteners are designed for maximum reliability. The VPB valve combines accuracy of 0.5% and control over a full 90° of rotation. When combined with DeZURIK’s Digital Valve Controller the VPB V-Port Ball valve sets a new standard for high performance and predictive maintenance functionality. In the event maintenance is needed, DeZURIK‘s unique design facilitates fast, easy breakdown and assembly of valve components with no special tools required. The result is reduced maintenance time and the lowest overall cost of ownership. Drop-in-place, self-aligning, bi-directional and interchangeable seat options offer ease in maintenance. Available seat options include reinforced PTFE, flexible metal and rigid metal. Reinforced PTFE seats provide FCI 70-2/ANSI Class VI shutoff, while the flexible metal seat provides shutoff equal to FCI 70-2/ANSI Class IV. DeZURIK‘s rigid metal seat provides FCI 70-2/ ANSI Class IV shutoff when the valve is installed in the preferred direction of flow into the ball face. The V-Port Ball valve design ensures unsurpassed accuracy over 90° of operation. Splined and locked ball-to-shaft connection, computer-designed ball, characterized v-port, low-friction bearings and low-friction packing combine to give superior control, including fast, accurate response to signal changes. These rigid connections effectively eliminate mechanical backlash and hysteresis. As standard, all DeZURIK V-Port Ball valve fasteners are stainless steel, providing easy disassembly. An additional maintenance feature is a bottom access cover for valve disassembly and reassembly. DeZURIK V-Port Ball valves feature the simplest maintenance procedures among control valves available. There are no threaded trim parts. The seat retainer and trim components drop in place ensuring precise alignment of plug and seat. Disassembly and reassembly are easily completed with no special wrenches or other tools required. On viscous and suspended fibrous services where routine maintenance is expected, the VPB’s drop-in trim, sealed bearings and self-aligning ball/seat reduce maintenance costs and minimize lost production. The sealed-bearing option prevents media from entering the bearing areas, which can hinder valve operation. PFA or Kalrez® seals are available for bearings that need exceptional protection from scaling, plating, abrasive or polymerizing media. The one-piece bearing provides a large area of radial support to the shaft. The shaft is fully supported, greatly reducing shaft fatigue and breakage. The PTFE-lined bearing has a low coefficient of friction that minimizes operating torques and reduces actuator sizing requirements. For severe-service applications, a Stellite® bearing is available. A sealedbearing option is also available. Intergrated Microcontroller The SIPART PS2® can be used in a conventional 4-20ma, analog control environment. It can also be used with HART, Foundation fieldbus, or Profibus communication protocals bringing you access to diagnostic capabilities that will allow you to ensure your process is operating at its peak effectiveness. Utilizing computer-aided design and extensive flowloop testing, the v-orifice was designed to provide the high rangeability and precision throttling required on fibrous suspension applications, as well as clean or dirty liquids and gases. DeZURIK V-Port Ball valves feature a streamlined flow passage, providing maximum efficiency (Cv/Kv per valve size) and minimizing erosion inside the valve body. The heavy-duty cast body is a one-piece design for increased installed-pipe integrity and minimal potential leak paths. Stainless steel construction combined with drop-in seats and a splined shaft and ball connection makes the DeZURIK V-Port Ball valve easy to maintain. DeZURIK VPB valves offer the ultimate in face-to-face flexibility. The solid one-piece body is available in either ANSI or ISA take-out dimensions. V-Port Ball valves are available in flanged or flangeless construction to meet individual requirements and common piping standards. For added versatility, these valves meet ISA, ANSI, IEC, ISO and EN face-to-face dimensions. In plants that have an installed base of both ANSI and ISA control valves, VPB users have been able to minimize storeroom inventory by stocking valve bodies, ISA retainers and ANSI retainers. A replacement valve with either face-to-face dimension can be quickly installed. DeZURIK also offers an integrally flanged one-piece ANSI body. Laying length flexibility is just another example of how the VPB can save money. PN 10, 16, 25 and 40, with DIN 10, 16, 25 and 40, and JIS 10, 16 and 20 bolting options are available in addition to ANSI. V-Port Ball valves feature a full, uninterrupted, raised-face gasket surface that provides maximum gasket integrity. The gasket surface provides full seal contact area with ANSI B16.20 gaskets. The self-aligning ball and seat on the VPB valve reduces lengthy setup time during repair and reassembly. Valves can easily be returned to like-new performance without time-consuming special procedures. And, because of the springloaded metal seat design, the ball and seat self-compensate for wear on either surface. This means that balls and seats do not have to be machine-matched the way many competitive styles do. Individual balls and seats can be maintained in storerooms–again reducing inventory on hand and associated costs. V-Port Ball valves are available with DeZURIK PowerRac® or Diaphragm actuators. The actuator top mounting pads or adapter brackets of currently manufactured DeZURIK rotary control and isolation valves (RCV, VPB, BHP) are compatible with the ISO-5211/1 standard. This common actuator platform increases flexibility and helps reduce spare parts inventory. versatility, all V-Port Ball valve seat options are fieldinterchangeable. Rigid seats are available for abrasive application including reclaimed fiber systems and applications with suspended chemical solids. The rigid seat provides shutoff performance to FCI 70-2/ANSI Class IV. Materials include 317 stainless steel and Hastelloy C. For enhanced abrasion resistance, a 317 stainless steel seat with tungsten carbide seating surface and solid Stellite® alloy bearing are available. An optional Inconel spring can be substitute fro the 17-7 PH stainless steel seat spring when added corrosion resistance is required. The rigid seat is designed for flow-to-open operations and is field-interchangeable with the reinforced PTFE and flexible metal seats.